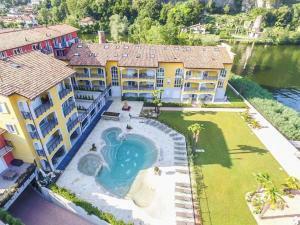 Just 300 metres from the shores of Lake Lugano, Caroline Hotel is located in a green, quiet area of Brusimpiano. It has an outdoor pool. Parking is free. Overlooking the lake or the pool, rooms at Hotel Caroline feature air conditioning and a TV. Free WiFi is available in public areas. A sauna, a gym and a small spa pool are some of the relaxing facilities at this 4-star hotel. A lounge with a large LCD TV is found on the ground floor. The Swiss border is about a 15-minute drive away, and the Swiss city of Lugano is 30 minutes by car. Guests can also reach Lake Maggiore in about 30 minutes, while Campione d'Italia is 26 km away. When would you like to stay at Caroline Hotel ? En suite room with tiled floors. Offers air conditioning, and a TV. En suite room with tiled floors. Offers air conditioning, and a TV.Please specify bed-type preference when booking. En suite room with tiled floors. Offers air conditioning, and a TV. The balcony has a view of Lake and Pool. En suite room with tiled floors. Offers free WiFi, air conditioning, and a TV. This double room has a tile/marble floor and air conditioning. Pool or lake view. Guests are required to show a photo identification and credit card upon check-in. Please note that all Special Requests are subject to availability and additional charges may apply. Please inform Caroline Hotel in advance of your expected arrival time. You can use the Special Requests box when booking, or contact the property directly with the contact details provided in your confirmation. Each day we'll check prices and send you an email for your selected dates at Caroline Hotel. If you don't have specific dates but would like to check prices for say next weekend or say next month we can check the price too. Click to write a review and share your experience of Caroline Hotel with other travellers.